Great Britain in the early 18th century was becoming a naval superpower, with colonies that spanned the globe. They wanted to take advantage of the natural resources provided by these colonies, in order to supply their ever growing need for shipping capacity. The Palatine Germans of the Hudson River Valley found themselves playing a role in this quest. On my father’s Brewster tree, there are a number of German immigrants who arrived in NY in 1710, during one of several periods of heavy emigration from the Palatine region of Germany. One patriarch was named Jacob Manck. He was born about 1669 in Urbach, Germany. He and his wife Anna Margaretha and their daughters traveled from Germany, first landing in England, then continuing to New York City. The British authorities wanted to settle these families outside of New York City, and came up with an idea that would solve their immigration problem as well as supplying their shipbuilding industry. 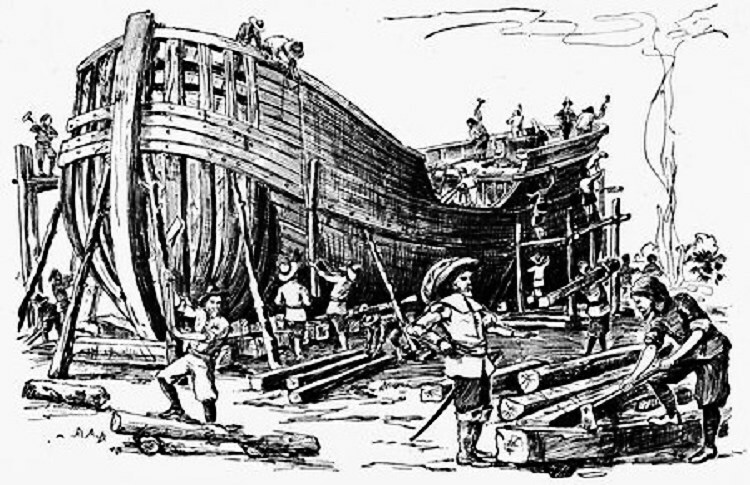 In order to pay off the cost of their transatlantic passage, the colonial government decided that the Palatines could work to produce “naval stores” for a number of years. Naval stores covered a variety of products needed to build and maintain ships, but the German immigrants in NY were targeted for the production of tar and pitch. At that point in history, Swedes were supplying tar and pitch to England, and as they had something of a monopoly, they charged exorbitant prices. The British decided to settle the Palatines in two locations along the Hudson River, using local pine trees and utilizing the river to transport the tar and pitch. The British divided the new settlers into East and West Camps, with a local structure put in place to distribute food and organize the naval stores production work. The camps were further broken down into villages, with a “listmaster” appointed to distribute provisions, keep written records of what each family received, and to help deal with the immigrant labor force. Besides daily beer and bread, the food rations included meat three times a week, along with fish, cheese, peas and flour four times a week. Jacob Manck was appointed listmaster of the Georgetown village in the West Camp. His position could only be held by a minority of the Palatine immigrants who could read and write. With their responsibilities, listmasters were given a military commission and a salary. Things didn’t work out quite as planned for the British authorities. The naval stores project never really got off the ground due to a number of problems. The tar and pitch production took several years to ramp up, and during this time large sums of money were being spent on feeding and housing the immigrants. Government support of the project waned. In addition, the Germans became more and more unhappy with their situation in the two camps. Most had been farmers in Germany, and had looked forward to working independently in the US on their own farms. They had no experience with the work involved in naval stores. There also seems to have been some misunderstanding regarding how much farm land was promised to the new workers. Unrest among the Germans caused ongoing conflicts with Robert Hunter, then the governor of NY. Once the naval stores project was abandoned, the Palatine immigrants were left to their own devices. Many, like Jacob Manck and his families, settled in Dutchess County. Others moved on to German settlements in New Jersey and Pennsylvania. Jacob Manck’s daughter Anna Veronica married a Palatine man named Johan Mattheus Jong. For several generations, these ancestors married within their Palatine community. They later blended with the local families of Dutch and English descent who populated the Hudson River Valley. Previous Post Huguenot – or not?